Asia Pacific napkin rings and table accessories to complete the look. Forged iron napkin rings with blue gemstone and flower detail. Stainless steel details. Resin horn bead napkin rings with tassel detail. Resin horn bead napkin rings with tassel detail. Set of four. Arrives in gift box. Add a pair of napkin rings to your dining set that will spark conversation at any event. Cut from one crystal quartz stone while keeping its natural finish, you're guaranteed to have a one-of-a-kind piece. Enjoy the elegance and attention to detail as you set these on the table. No two napkin rings are the same in our vast collection, and this pair is no exception. The always-stunning rose quartz is a unique piece of art that can be added to any dining set. 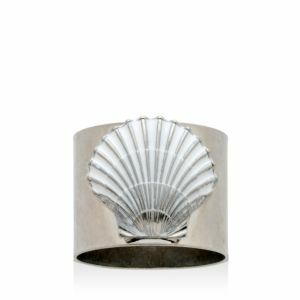 Enjoy these all-natural napkin rings and their custom-designed beauty. These lovely napkin rings, accented with beautifully Brazilian natural agate, promise to add just the right touch of elegance and art to your next dining affair. Forged iron napkin ring with nickel bird detail. Handcrafted terradura clay napkin holder hand-dipped in glaze. 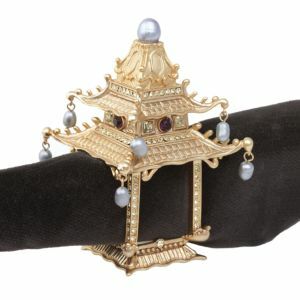 An expression of our culture and emotions through craftsmanship and design. Forged iron and nickel wing napkin rings. The Godinger Ribbed Napkin Rings Set provides a mix of classic and modern table settings, allowing them to go with all presentations. 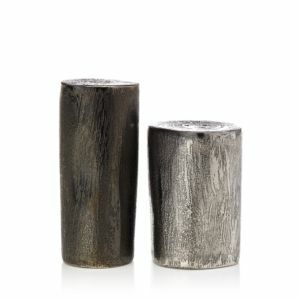 Brass/zinc/enamel Design Imports napkin rings are the perfect finishing touch to your table setting. Our large variety of napkin rings allows you to transform your table for any season or occasion. The Godinger Diamond band napkin rings in four color stones-red, blue, amber, gray- add a distinctive feel to any napkin. The Godinger Stone Napkin Rings with stones on a thin crisscross border enhance the formality of any occasion. 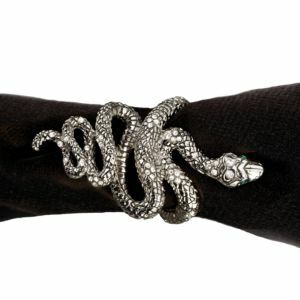 The Godinger Croco Design Napkin Rings are great for the modern home and clean styled dinner party. Perfect for serving homemade salads and sides, these salad servers are handcrafted by artisans in Kenya. The eye-catching wood grain makes a special presentation during celebratory meals. This shovel salad server set is crafted by skilled artisans in Kenya. Each piece is made from beautifully grained wild olive wood which is known for its striking grain patterns and durability. Rustic wood cream & sugar set handmade by artisans in Kenya from scraps of wild olive wood. Wild olive wood grows in protected areas in Kenya and is known for its stunning grain and durability. Add a touch of interested to your next meal with these beautifully crafted salad servers. Handmade from wild olive wood by artisans in Kenya. A chef’s serving delight at any mealtime! Elaborate design inspired by the gingko tree and fauna Handcrafted Butterfly Ginkgo cocktail napkin holder. 5.25"Sq. x 1.75"T. Crafted of stainless steel, natural and oxidized brass, and powder coating. Handcrafted napkin rings. Natural and oxidized brass. Add a brilliant touch of nature to a dinner or buffet with this distinctive set of four Leaf spreaders from Godinger. Each stainless steel blade is attached to a decorative textured brass handle featuring a different leaf shape. Stainless steel Serve cake, pie and other treats to family and guests with this elegant set of Godinger Pineapple dessert forks. The handle of each gold-tone stainless steel piece is decorated with a textured pineapple icon, a symbol of hospitality and friendship. Textured brass combines with mirror-polished stainless steel to make the Haper cake serving set by Godinger a distinctive gift for a wedding or anniversary. Wildly appealing accent for your table. Set of two as shown; each, 1.5"W x 3"D x 3.5"T. High-fired porcelain with goldtone detailing. Arrives in Jonathan Adler gift box. Shaped like traditional "monkey's fist" sailor's knots, the Nautical Accents Knots Salt and Pepper Set is an ideal table accessory for picnics and patio or poolside parties. From kate spade new york's Cannon Street Collection. Handcrafted stainless steel cheese knives. Black nickel-plated handles. Natural brass trim. Three-piece set. Handcrafted napkin holder. 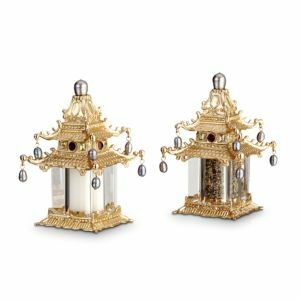 Made of marble, antiqued gold-tone metal, and stainless steel. Handcrafted ceramic salt and pepper shakers. What a zoo! Animal-shaped salt and pepper shakers from kate spade new york's Woodland Park collection are a fun surprise in black and white and full of personality Rocket ship salt and pepper shaker set. 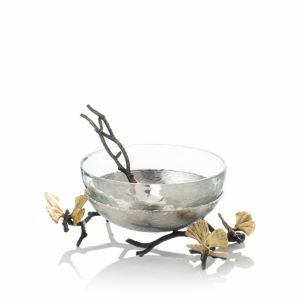 Made of high-fired porcelain with metallic accents. Arroyo modern, nestled salt and pepper shakers. Overall, 5"W x 2.5"D x 3.5"T. Crafted of fine 18/10 stainless steel with copper and brass plating. 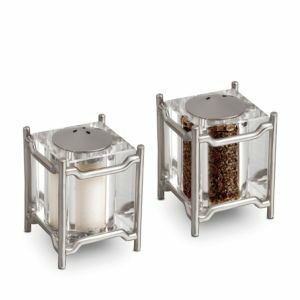 L'Objet's handcrafted crystal salt-and-pepper set brings a chic, streamlined element to the table. Dress up your table with reptile style. Sparkling crystals and artisanal metal details artfully distinguish these handcrafted snake-inspired table accents from L'Objet. Sparkling crystals, saltwater pearls and artisanal metal details artfully distinguish these sculptural handcrafted table accents from L'Objet. Brass/24k gold plated/Swarovski® crystals/saltwater pearls L'Objet's handcrafted crystal salt-and-pepper set brings a chic, streamlined element to the table. Rustic, redefined. Add an element of nature to your tablescape with this handsome charger, crafted of richly grained acacia wood. From Noritake's Kona Wood collection Bring the beautiful warmth of rich acacia wood into your home with Certified International's wood serveware. This versatile four-piece charger plate set is food safe and functional. Surrounded by our hand-carved wood charger, plates take on an organic, natural quality. Handcrafted charger plates sold individually. Brass- or nickel-plated aluminum. Effortlessly elevate your dinnerware collection with a shimmering, opalescent charger - it's perfect for holidays and special occasions alike. Hand carved from shimmering capiz shell, this elegant charger brings the natural beauty of the beach to your kitchen. Handcrafted charger plate. Hammered forged iron. Natural finish. Effortlessly elevate your dinnerware collection with a gleaming charger - it's perfect for holidays and special occasions alike.